This is one of the best soups I’ve made all winter. 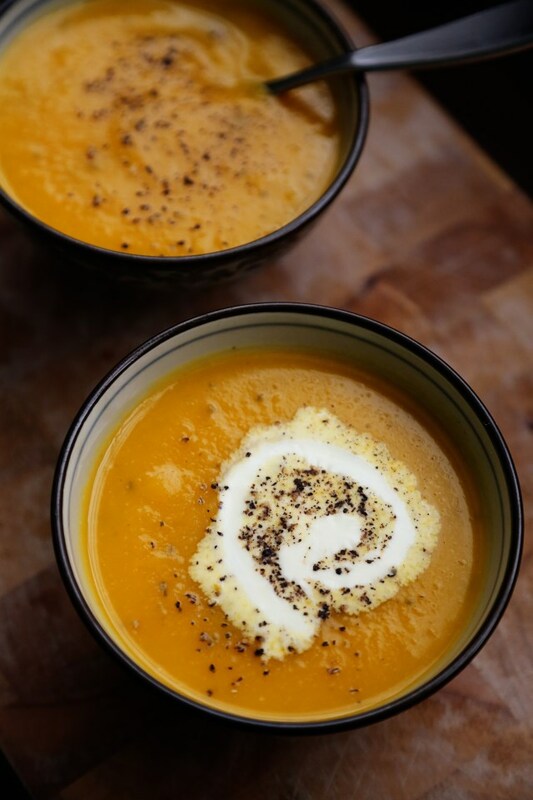 Previously, butternut squash soups were borderline too sweet for me – I could never finish an entire batch and would guiltily throw the leftovers down the sink. I’ve made this version three times, now, and each time, we eat it all! It doesn’t get boring – the flavors are so complex and balanced, thanks to that crazy looking celery root. It’s perfect! It’s also incredibly filling and very low fat, so I think it’s quite possibly the most wonderful food to have when you’re watching what you eat, but don’t want to feel deprived. It’s also perfect as a baby food! With just two simple vegetables, it’s a great way to introduce flavors to a little one just starting out on solids, or a toddler who might eat soup better than they would eat a new vegetable. For toddlers, I think the best way to serve soup is in a small, handled cup. Fill it half way and let them sip at their own pace. 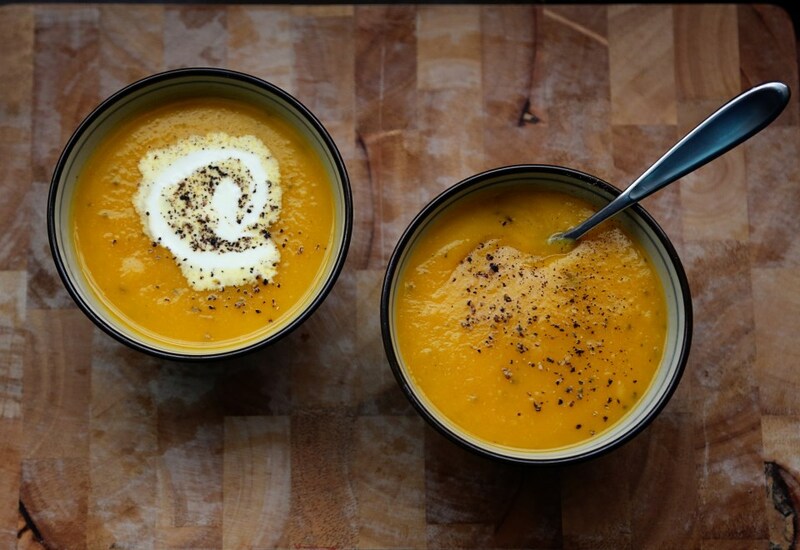 They love feeling in control and YOU will feel better with limited soup-spills as would occur most certainly if you handed them a spoon 🙂 This soup is also a great way to introduce YOU to a new vegetable! Who here has bought and prepared celery root? (also called celeriac) If you haven’t, you don’t have to be afraid – it tastes like celery with the consistency of a sweet potato! I’m happy to announce a little cooking segment I’ll be doing this year on my friend, Paul’s PBS show, 24 Frames! (this soup makes an appearance!) It’s very exciting to be a part of something creative and I’m deeply flattered that he included me in his show. I love talking about food more than anything, so once I get over the mortal fear of seeing myself talk on camera, I’ll finally start to enjoy watching my own segment. Please tune in to 24 Frames every Saturday night at 9 p.m. Central on PBS! The show should be available online very soon for those who don’t live in this area, and when it is, I’ll post a link! Thank you all for watching and for reading my blog. It’s very humbling and I hope you can feel a little more confident in the kitchen with every new recipe you try! 1. Peel and chop the onion, celery root and butternut squash. 2. Heat the oil in a large stock pot. 3. Add the onion and cook, stirring often, until softened, about 5 minutes. 4. Stir the squash, celery root and salt into the pot and cook for about 10 minutes until the squash begins to soften. 5. Add the rosemary and chicken broth and bring to a boil. Reduce heat and let simmer over medium heat, partially covered, for 20 minutes, or until vegetables are tender. 6. Using a blender in batches, or an immersion blender, puree the soup until completely smooth. Adjust the seasoning with salt and pepper and thin out with cream or extra stock as desired. Ladle into bowls and add a swirl of cream and a few dashes of fresh cracked pepper and serve! This entry was posted in Baby Food Recipes, Children, Cooking Tips, Fall Flavors, Healthy Meals, Hearty, Meatless, Monday Meals, Soups, Thanksgiving, Vegetables and tagged baby food recipes, big batch soups, butternut squash, butternut squash soup, celery root, celery root puree, diet recipes, easy, healthy recipes, hearty soup, soup, toddler food, weeknight meals, winter meals, winter soups. Bookmark the permalink. Usually celery wouldn’t be the first ingredient that came to my mind if I wanted to make squash soup but this time I wanted to clean up my fridge before going on a holiday, and I needed to use that squash and that sad looking half of celery root. And what a surprise! The soup was simply DELICIOUS!! Squash and celery blend very nicely, and rosemary also suits perfectly. Thank you for the recipe, I’m putting it in my bookmarks! That’s awesome! I know, it’s a strange addition but it just works! Glad you loved it!